An artist’s conception of an NEO asteroid similar to 3122 Florence orbiting the Sun. Credit: NASA/JPL. Ready to hunt for low-flying space rocks? We’ve got an interesting pass of a Near Earth Asteroid (NEA) this upcoming U.S. Labor Day weekend, one that just slides over the +10th magnitude line into binocular range. We’re talking about asteroid 3122 Florence, which passes 4.4 million miles from our fair planet (that’s 7 million kilometers, about 18 times the distance from Earth to the Moon) this Friday on September 1st at 12:06 Universal Time (UT)/ 8:06 AM Eastern Daylight Saving Time (EDT). Universe Today ran an article on the close pass about a week ago. 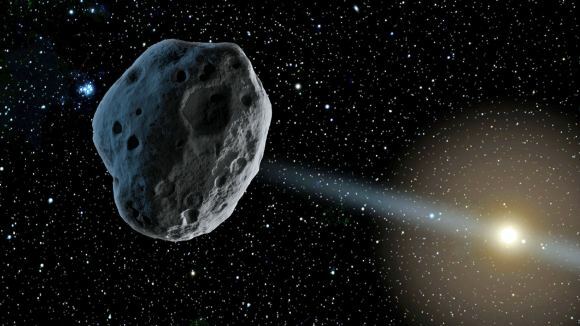 Now, we’d like to show you how to see this asteroid as it glides by. Ordinarily, a four million mile pass (about 4.7% of an astronomical unit, just under the criterion to make 3122 Florence a Near Earth Object) isn’t enough to grab our attention. Lots of asteroids pass closer weekly, and 3122 Florence is certainly no danger to the Earth this or any week in the near future. What makes this asteroid an attractive target is its size: NASA’s NEOWISE and Spitzer infrared telescope missions estimate that 3122 Florence is about 2.7 miles (4.4 kilometers) in diameter, a pretty good-sized chunk of rock as near Earth asteroids go. The inclined orbit of 3122 Florence. Credit: NASA/JPL. The last large asteroid with a similar close approach was 4179 Toutatis, which passed just under four lunar distances (a little under a million miles) from the Earth on September 29th, 2004. Asteroid 3122 Florence (1981 ET3) was discovered by prolific asteroid hunter Schelte J. Bus from Siding Spring observatory in Australia on the night of March 2nd, 1981. Named after social reformer and founder of modern nursing Florence Nightingale, this weekend’s pass is the closest 3122 Florence gets to Earth over a 600 year plus span, running from 1890 (well before its discovery) out past 2500 AD. Plans are afoot to ping 3122 Florence using Goldstone and Arecibo radars as it passes by the weekend. we might just see if it has a any attending moonlets or a strange bifurcated shape like comets 67/P Churyumov-Gerasimenko or Comet 45/P Honda-Mrkos-Pajdušáková very soon. Asteroid 2014 JO25 imaged by Arecibo earlier this year… are contact binary ‘rubber-duck’ shaped asteroids and comets a thing? Credit: NASA/Arecibo/NSF. 3122 Florence has an inclined orbit, tilted 22 degrees in respect to the ecliptic plane. Orbiting the Sun once every 859 days, 3122 Florence travels from around 1 to 2.5 AUs from the Sun, making it an Amor class asteroid which journeys beyond the orbit of Mars and approaches but doesn’t pass interior to the orbit of the Earth. This week’s pass sees 3122 Florence rapidly vaulting up from the southern to northern hemisphere. This apparition culminates on Friday, September 1st, at 12:06 UT as the asteroid crosses the along the border of the constellations Equuleus and Delphinus at closest approach, reaching +9th magnitude. 3122 Florence will be moving at 20′ per hour (that’s about 2/3rds the diameter of the Full Moon) at closest approach, fast enough that you’ll notice its motion against the background stars in a low power field of view after about 10 minutes or so. The path of 3122 Florence through the sky this week, times for the tick marks are in EDT (UT-4 hours). Credit: Starry Night Education software. 3122 Florence crosses through the constellations Piscis Austrinus, Capricornus, Aquarius, Equuleus and Delphinus this week. Keep in mind, the Moon is headed towards Full next week on September 6th, making the next few evenings a good time to track this fleeting space rock down. 3122 Florence from August 28th, about 8 million kilometers from the Earth. The asteroid is the center dot, while the streak to the left is the geostationary satellite AMC-14. Credit: the Virtual Telescope Project. Tonight is also a good time to track down 3122 Florence, as it passes just 16′ from +3.8 magnitude star Zeta Capricorni. It also threads its way through the tiny the diamond-shaped asterism of Delphinus the Dolphin just over week after its closest pass on the evening of Saturday, September 9th. Currently, 3122 Florence is 45 degrees above the southern horizon around local midnight for observers based along 30 degrees north latitude. The best view during Friday’s pass is from the Pacific Rim, including Australia, New Zealand and surrounding regions at closest approach. The orientation of the Earth as seen from asteroid 3122 Florence during Friday’s closest approach. Credit: Starry Night Education software. North American viewers will get a good view at local midnight just about eight hours prior to closest approach on the night of August 31st/September 1st, about 60 degrees above the southern horizon. The next good views occur the following evening about 16 hours after closest approach, as the asteroid is receding but 10 degrees higher above the southern horizon. The 24 hour celestial path of of 3122 Florence through the night sky, centered on the September 1st closest approach. Tick mark times are in EDT (UT-4 hours). Created using Starry Night Education software. A series short wide field exposures over about an hour revealing stars down to +10 magnitude should reveal the motion of 3122 Florence against the starry background. A good visual alternative is to sketch the suspect star field about 10 minutes apart, carefully looking for a ‘star’ that has moved during the intervening time. JPL Horizons is a good place to generate accurate right ascension and declination coordinates for 3122 Florence to aid you in your quest. This one is distant enough to simple geocentric coordinates should suffice, and observer parallax shouldn’t shift the position of the asteroid significantly. Clouded out? The good folks over at the Virtual Telescope Project will be featuring 3122 Florence during a live webcast starting on Thursday, August 31st at 19:30 UT/3:30 PM EDT. And this is a great pre-show for a smaller and closer anticipated asteroid pass coming up in a few short weeks, as 2012 TC4 buzzes the Earth on October 12th, 2017. Good luck in your quest to find 3122 Florence… let us know what you see!